Major shifts in public policy invariably produce unintended consequences. Nowhere is this more clear than in policies affecting the working poor. 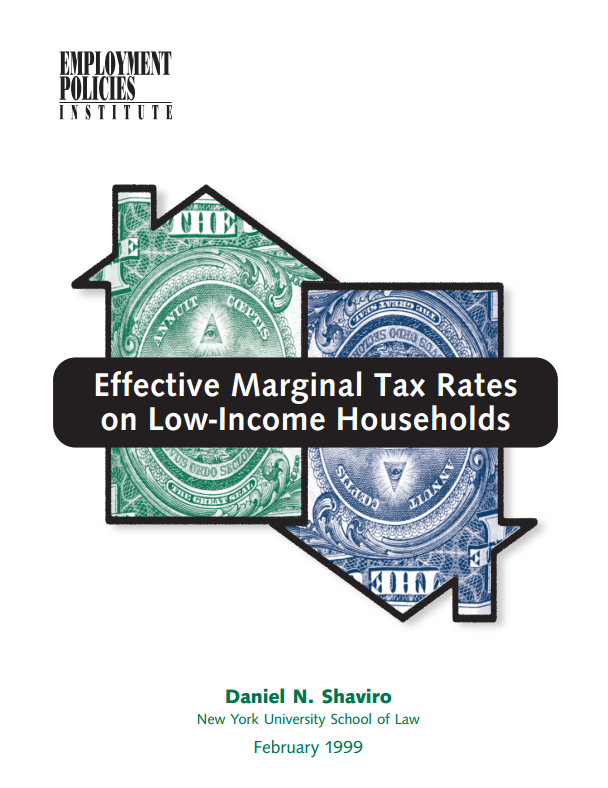 In this paper, Professor Daniel Shaviro of New York University demonstrates that America’s working poor are subject to punishing marginal tax rate effects that can sap most — and, in some cases, all — of the higher earnings accompanying their wage increases. Professor Shaviro utilizes data from 11 states to examine the economic forces affecting the working poor. Past reports have recorded the potential for welfare recipients to achieve higher living standards by relying on public assistance rather than earned income. Professor Shaviro explores an important new angle: the income effects of earnings increases, focusing on scenarios facing a single parent with two children. He estimates the degree to which earnings gains are partially or wholly offset by reductions in government assistance across a range of earnings levels. He isolates the effects in states that offer high levels of public assistance and those found in “low-benefit” states. As an example, in states with ostensibly generous welfare benefits, Professor Shaviro shows that a single mother with two children could increase her earned income from $10,000 per year to $25,000 per year and actually find herself with 2,540 fewer dollars once she accounts for lost tax credits and benefits. Though her earned income more than doubles, she is worse off financially. The marginal tax rate effect applies (with varying consequences) at every step in the wage ladder. Yet at every step, as wages rise, the working parent in this example faces substantial tax rate effects that claim between 58% and 109% of the next dollar she earns from a full-time job (see tables). How does one account for these radically counterintuitive (and presumably unintended) effects? In a nutshell, such massive effective tax rates are the result of rapid-fire changes in means-tested federal tax credits, Food Stamp and Medicaid benefits, housing subsidies and welfare payments. The tax effect is magnified by payroll taxes that apply to the first dollar of income. As earned income rises, declines in unearned income offset large portions of the gain. Professor Shaviro notes the nonsensical nature of this “system.” No thinking legislator would create such a program from scratch. Yet these are factors that determine the success or failure of public policies intended to aid the working poor. Rather than studying specific public policies, Professor Shaviro limits his research to measuring the earnings effects faced by an important segment of today’s low-income workforce. He equips policy makers with a simple, unbiased framework for estimating the benefits (or lack thereof) of various proposals, and leaves the application of the framework to others. Those who take the next step find stunning results. For instance, policymakers at the federal, state and local levels often face a simple question: do mandated wage hikes benefit the working poor? Well-meaning legislators simply presume the answer is “yes.” They ask how anyone earning entry-level wages could not benefit from a higher hourly wage. In reality, the consequences of a mandated wage hike contrast sharply with the intentions of those proposing the policy. If we are to believe the proponents of higher minimum wages, a one-dollar-per-hour hike in the federal minimum wage (to $6.15 per hour) would create more than $2,000 per year in added income for a full-time worker. But if that worker is a single parent with two children, she would face astonishing effective tax rates on her additional earnings — rates as high as 90% in some states. If the mandated wage hike is just a few cents higher (e.g., $6.45 per hour), she faces effective marginal tax rates averaging 78% to 109% in the states examined here (see chart). This is hardly the answer to poverty some policymakers prophesy. The framework in this paper allows a glimpse at another inequity in mandated wage increases. Assuming the federal wage floor rises by a dollar (to $6.15 per hour), a single working teen or childless adult under the age of 25 would take home approximately $1,544 (or 69%) of the raise, after taxes. By contrast, a single mother of two, working full time in a state that offers generous public assistance benefits, would retain only $52.42 of the extra earnings—a mere 3 percent of the amount kept by the childless young adult. Arguably, those who need additional income the most receive the smallest “raise,” while those who need less get much more. Based on these findings, there is little doubt that higher mandated wages rarely “create” substantial benefits for low-wage adults supporting families. This fact should give rise to substantial doubts in the minds of those promoting city-level “living wage” mandates, which have already been implemented in more than a dozen major cities. These ordinances, which generally apply to workers in firms with city contracts or receiving city subsidies, commonly mandate wages as high as $10.75 per hour, and proposals call for even higher rates. But huge marginal tax rate effects (as high as 78%) persist even up to wages levels of $12.50 or higher for full-time workers. Thus, the hourly income gains foreseen by living wage proponents likely are not materializing. In the midst of a debate too often consumed by hyperbole, Professor Shaviro cuts straight to the core of the issue that should consume policy makers interested in helping the working poor: the actual income incentives and effects facing low-income workers. Professor Shaviro analyzes one of the most important but least recognized determinants of success or failure when wage or welfare policy changes are implemented. His contribution will prove invaluable not only in the ongoing federal minimum wage and welfare debates, but in similar discussions taking place in state houses and city councils across the nation.